Brachyorrhos albus Bleeker, 1857c: 472; 1860: 286. Karnsophis siantaris Murphy and Voris, 2013: 142 Holotype: USNM 103578, adult male from Siantar, Sumatera Utara, Sumatra, Indonesia. Distribution: Known from type locality, Siantar, Sumatera Utara, Sumatra. However, Bleeker (1860) reported Brachyorrhos albus from Agam (~0º15’S 100º 05’E) and Padang (~0º 57’S 100º 21’E) both central Sumatran locations which likely represent this species. Diagnosis: Fangless, 19 scale rows not reduced posteriorly, premaxillary absent t nasal bones greatly reduced in size, neural spine is present on the atlas (absent in Brachyorrhos). Distinguished from Brachyorrhos by its depressed skull, rostral not visible from above; eye diameter greater than eye-mouth distance, counter sunk lower jaw, laterally compressed tail. 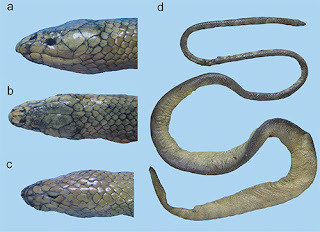 Distinguished from Calamophis by 19 scale rows just anterior to the vent (Calamophis has 17); divided internasal (single in Calamophis); divided nasal scale (single in Calamophis); two postoculars (one in Calamophis).